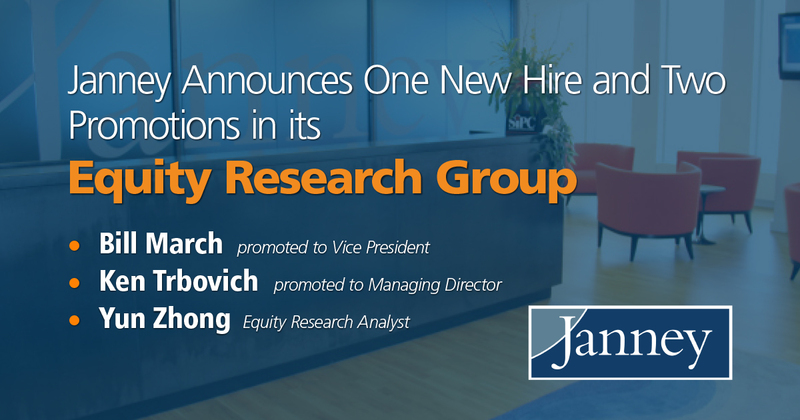 Philadelphia, PA – November 6, 2017 – Janney Montgomery Scott LLC (“Janney”), a leading full-service wealth management, capital markets, and asset management firm headquartered in Philadelphia, PA, welcomed one new hire and promoted two Janney employees in its Equity Research Group, helping to expand its equity research coverage of the healthcare industry. Yun Zhong has been hired to cover the biotechnology sector with a focus on gene therapy and central nervous system diseases. Yun has a PhD in Neuroscience & Molecular Biology from Rockerfeller University and has been covering biotech stocks for the past seven years at Sun Trust Robinson Humphrey and Cowen & Company. Ken Trbovich has been promoted to Managing Director at Janney, and will continue to lead and help grow the firm’s specialty pharmaceuticals franchise. “Ken has been a tremendous addition to our healthcare team since he was hired in 2015. His depth of knowledge and quality of corporate and institutional relationships are the cornerstone of Janney’s presence in this important sector,” said Dan Wantrobski, Janney’s Director of Research. Bill March has been promoted to Vice President. His focus will be on expanding coverage in healthcare technology with an emphasis on extending Janney’s reach in its leading life science tools franchise. Bill’s coverage will encompass contract manufacturing, contract research, and healthcare services. “The pace of innovation in drug discovery and development has reached an inflection point that has allowed for sustained growth of new drug approvals for everything from cancer to rare diseases. Biotechnology, life sciences tools, and specialty pharmaceutical companies will each play pivotal roles in allowing our healthcare system to improve the quality of treatments and outcomes for patients, while also fostering a competitive environment to bring costs down,” said Paul Knight, Janney’s Head of Healthcare Research. “The healthcare industry’s importance to our national and regional economy continues to expand. Our firm is committed to providing clients with high quality, proprietary research generated by professionals with deep and relevant industry experience. The individuals we’ve hired and promoted will further establish our firm as an important resource for both our institutional, corporate, and retail clients,” said Andrew Maddaloni, Janney’s Head of Equities.